MYSURU: Living amidst the greenery and hearing the chirping of birds in the urban concrete jungle is a dream for many. But not for Rev Benjaminvas. The 59-year-old was determined to lead his life this way, so he decided to bring spring into his home by turning his house into a ‘green house’, literally. 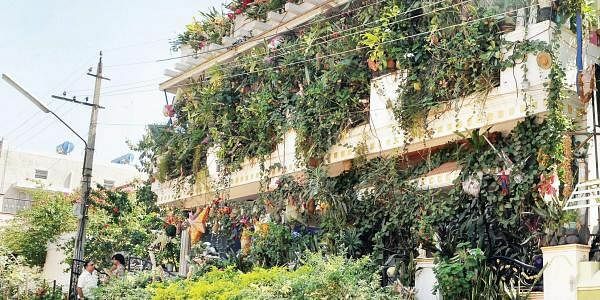 The house, with a staggering 8,500 plants covering every inch of space, has become a familiar sight and a major attraction in Gokulam, Mysuru. The two-storeyed house named ‘Jericho’ is built on a 45x60 site. The plants are grown in every nook and corner of the house in discarded bottles, tea cups, tubs, clay pots and small containers. Benjaminvas has taken the concept of gardening literally to new heights by completely using the terrace for his plants. Creepers and plants grown in pots dangle from the terrace giving the house a cool green effect. The ‘plant planet’ took root in January 2005. What started with hundreds of plants, today boasts of thousands. And the plants attract varieties of birds, where some have started nesting. This apart, he has an aviary, which houses more than 70 birds. Hailing from Somwarpet, Kodagu district, living amidst plants was quite natural for Benjaminvas. But when he shifted to Mysuru, he started missing the greenery. Thus he decided to plant trees. 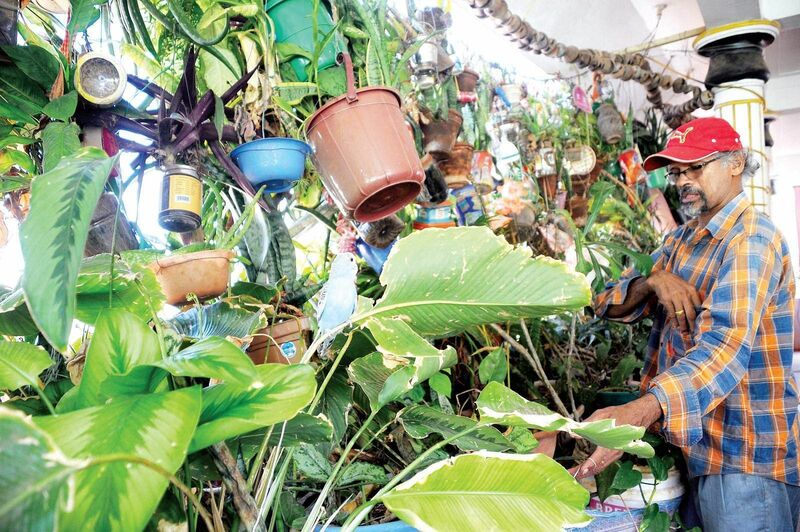 Today he has more than 200 varieties of plants growing in his house. He is doing his bit to save the environment. When one enters his house, one can feel the cool effect because of the natural ventilation. By growing plants in discarded plastic material, he is protecting the environment. Kitchen waste is converted into manure, and he is also saving electricity. He grows vegetables, medicinal plants, and several other plants needed for daily life. He says maintaining the plants is not expensive. Once in a week he sprinkles water in the pots and uses organic manure. His wife M H Rietta, a Physics professor at Maharani’s First Grade College, and children Jordanvas and Zion, who are studying in second PUC and Class 10 respectively, help him in watering the plants weekly once and in other chores. ‘We use bio-waste compost, neem oil, neem cakes, egg shells along with manure. So weeds will not grow and insects and flies are prevented,” he said. Hibiscus, rose and seasonal flowers are given to neighbours. Those who know about the benefits of medicinal plants come and collect the leaves. Vegetables are for home consumption. His house has evoked admiration and curious comments too. “There are instances when visitors ask whether the hanging pots fall down. They are concerned that we might get injured if such an incident happens. Some are curious to know how we hang the pots. Some others look wide-eyed at plants grown in tea cups,” he says with a smile. People aptly call the house ‘Hasiru Chappara’ (Green canopy).